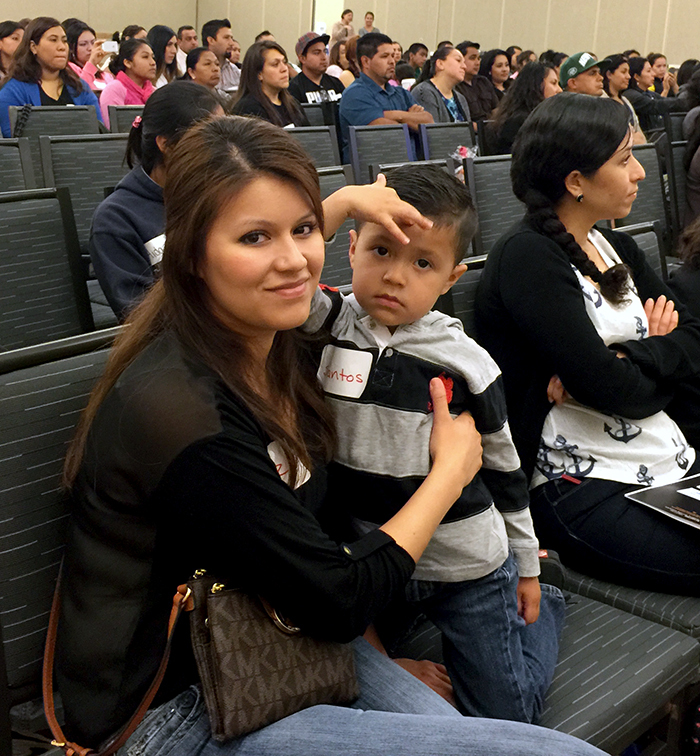 More than 100 low-income, mostly Spanish-speaking parents visited Sonoma State University on May 2 to learn how they can make attending college possible for their children and themselves. The parents and their children are part of the Avance Parent-Child Education Program. Ten groups participated in the nine-month program, which stresses its message of "graduating from college begins at birth. "The future of our county, our workforce, our quality of life, is dependent on the educational attainment of Latino children," said Alfredo Perez, executive director of First 5 Sonoma County, which has funded Avance since 2010. "We owe it to our children to give them the future they deserve by investing in programs like Avance." The tour, made possible with funding by Sonoma County Wine Country Weekend, began with a presentation by Sonoma State enrollment director Gustavo Flores, who told parents how they can prepare their children for college, including how to access financial aid. A bilingual student panel followed, with personal stories of how students overcame obstacles on their own paths as first-generation college students. Sonoma State students led the participants on a tour of the campus, and the day ended with a real-life college experience--eating lunch in the Kitchens, the student dining facility inside the Student Center. "Since I started Avance, I tell my 2-year-old son he will go to university. He didn't understand. Now he says, 'Avance is my little school, this [SSU] is my big school,'" said participant Itzel Gudino de Avila of Santa Rosa. "He was in love with the trees, all the little dorm rooms, and the pizza!" Avance is a national nonprofit headquartered in San Antonio, Texas. For 40 years, it has administered a two-generation parent-child education program focusing on the parent as the first teacher and the home as the first classroom. The curriculum, consisting of toy making, child development, community resources and home visiting, is delivered to parents or other caregivers and their children from birth to age 3. Avance's two-generation approach has empowered low-income Latino parents to break free of poverty and to pave the way to a brighter future for themselves and their children. Since 2010, 800 Sonoma County families have participated in Avance, and First 5 has invested $2.2 million in the program. The nine-member First 5 Sonoma County Commission was established through the California Children and Families First Act of 1998 and directed to promote, support, and improve the early development of children from the prenatal stage through 5 years of age.